The great Chassidic Rebbe, the Aish Kodesh, taught that a Jew can only connect with the holy inner essence of Passover through the scrubbing and sorting and cleaning in the days and weeks leading up to Seder night. Just as we cannot feel our internal organs, our hearts, our lungs, our muscles until we move our bodies and we suddenly feel them pumping and beating and straining within us, so, too, the Aish Kodesh wrote, we will only be able to experience the hidden holiness and light of Passover after we have moved our bodies and prepared our homes on a physical level. And Rabbi Nivin told her that, in fact, the cleaning itself IS the holy part. Cleaning for Passover is a mitzvah, which means that every moment you and I spend scraping grime out of our stoves or searching behind our children’s bunk beds for well-hidden chocolate-covered wafers, we are performing Hashem’s exact will at that moment. That means that every minute we spend cleaning until Passover, we are engaged in the holiest activity in the world. I also do other things to prepare spiritually for Passover– like listening to lots of classes (while I clean;) about the deeper meaning of the holiday. 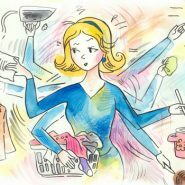 But I still believe that my most meaningful spiritual preparation for the holiday is actually physically preparing for it–cleaning and organizing my home, shopping, cooking. Because sometimes the holiest act possible doesn’t feel holy at all! But it IS holy, because it is Hashem’s exact and perfect will for me right now. if you think about it, the Jewish people have been in suspended animation for 2000 years. our original form of spiritual service was in the mishkan and the beis hamikdash. it was a very physical service. and it consisted of alot of cleaning. so preparing for Pesach thru physical cleaning is a return to our original form of service. interesting, that in fact the physical form of avodat Hashem is closer to the original avoda in the mikdash. Thank you! You seem to have internalised this. Like you have shifted from having a teaching help you to actually being bisimcha lichatchilla. The whole purpose of the world is to bring the spirituality of Hashem into the physical world by doing physical activity with actual things. So you are 100% right that the cleaning is the most spiritual thing you can do. Chag kosher v’sameach. May we merit the complete redemption K’ymay tzaischem maEretz Mitzrayim. thank you for this post!I started re-reading the notes on Rabbi Nivin’s Pre-Pesach chabura from a couple of years ago as well as Rabbanit Yemima’s shiurim. They are amazing and really gives chizuk to cleaning with meaning. I personally need the spiritual stuff to help me along, as well as learning the hagada and other Pesach-related Torah so that I can contribute to the discussion at the table and throughout chag. I think it’s important that our kids see us cleaning b’simcha and with meaning, but also that they see we know what the chag is actually about (Exodus from Egypt, etc). I like the cohanim example, because our job is also to spiritualize the seemingly technical and mundane.